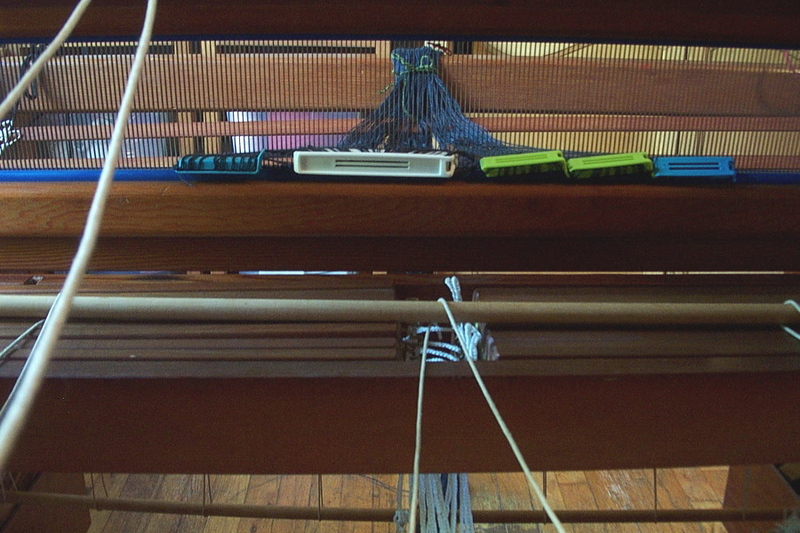 I put that pesky warp for the Summer and Winter samples on the loom. I may never weave the baby blankets, and it may be wasted effort, but at least it is short. One might even say ridiculously brief. 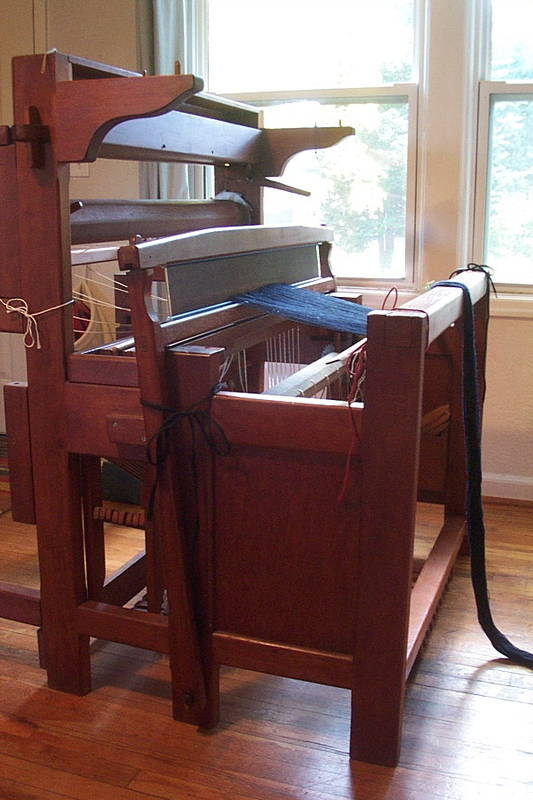 At around 57″ it is the equivalent of dressing my loom in a 9″ mini skirt. So, I have been asking myself: if I love the snow this much, how come I live somewhere that usually doesn’t have a winter, just a cold-ish season between the two squelchy ones? Good question! I never thought view from my kitchen window would be able to compete with Jane’s for wintriness, but here are my dead sunflowers wearing little conical hats! I have only two problems with this weather. The first is a phenomenon that has been mentioned by a lot of other Pacific Northwestern bloggers, but which bears repeating because it is just so weird. There are no routines to deal with snow here. Instead, white stuff falling from the sky prompts an immediate crisis mentality–and not the kind of crisis where people pull together, but the kind where they peek out of their windows at the burning house across the street. I doubt the city or county even owns a snow plow. (If they do, we haven’t seen it.) There isn’t even any guy-with-a-truck-who-will-take-your-money plowing going on! Taking a cue from the city streets and local businesses, nobody shovels their sidewalk. Come on, it’s been out there nearly a week! The School For the Blind shoveled, but that’s about it. People stay inside Hoping It Will Just Go Away until they can’t stand it anymore or run out of Keystone Light, then rush out to drive like absolute doofuses on the slick, uncleared roads. This makes great conversation for everyone who has lived in the mountains or in New England. We get to shake our heads over the wimpiness of the infrastructure and the supposed “outdoorsiness” of the natives. My other problem is the quality of the snow. Because of the strange mix of weather systems in play where we live, heavy snow is almost always followed by freezing rain. This is cruel to the temperate zone trees and shrubs, and has mostly (along with the doofussy drivers and lack of shoveling) kept me indoors. With layers of ice like frosting between the layers of a cake, it’s not the kind of snow it’s fun to play in. But none of this is really a complaint. Ever since I woke up yesterday morning and thought, “I get to thread today!” I have been wondering why snowy weather is the perfect weather for weaving. Obviously loom dressing and weaving lend themselves really well to large chunks of time without distractions, and you can set those aside without any guilt when the weather has you housebound. But I have also noticed that the reflected light from the snow has filled my normally dark apartment with a clear, diffuse light. Point-source light casts confusing shadows when I am dealing with ranks of Texsolv cords and heddles. Crawling under the loom and threading were so much easier with the snow-light! 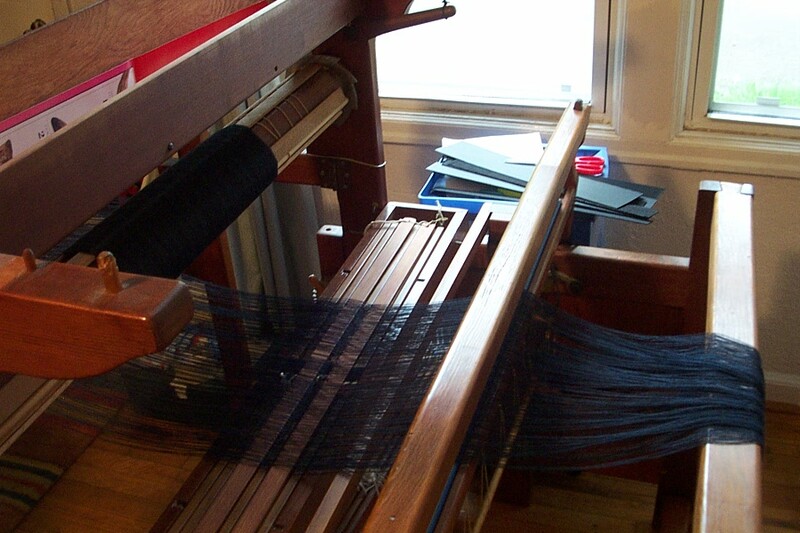 Another thing I noticed was that I was moving my whole body getting around the loom. 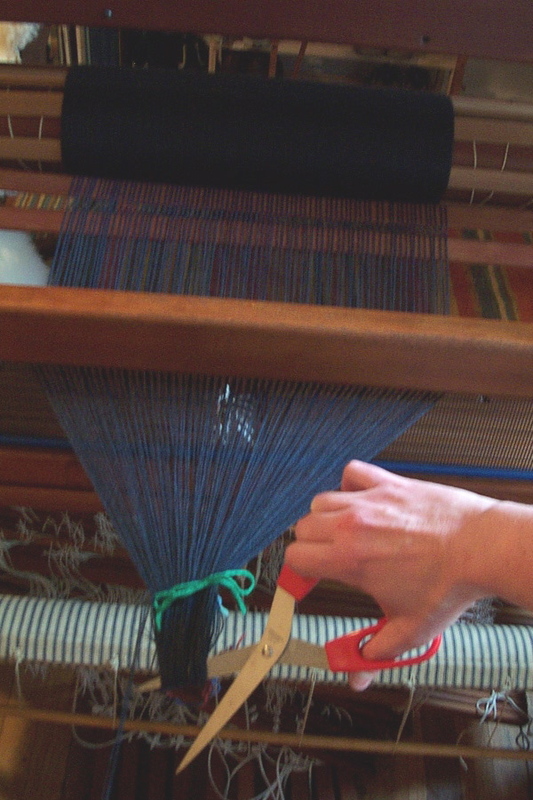 Warping takes about the same degree and variety of effort as gardening. I don’t know of any other way to get that sort of physical activity indoors. It’s the perfect antidote to the “I have been sitting in this chair too long and I am not up to cleaning the bathroom” syndrome. Especially since, as with gardening, I get the satisfaction of making something. No wonder weaving as has persisted so strongly as a home craft in the Nordic countries, where the winters are long and snowy and the traditional houses tend to be short on windows. Yesterday afternoon I was trying to finish threading before the daylight disappeared. I just made it! Now I am going to go sley. 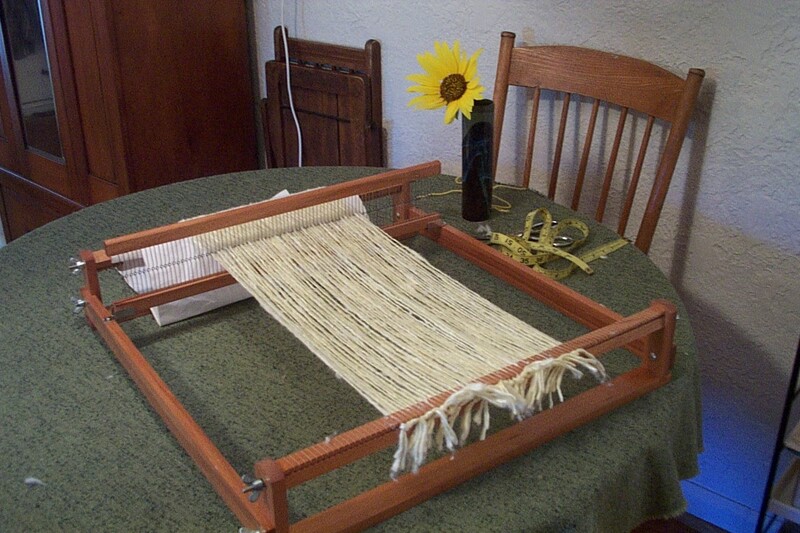 A while ago I made a little resolution that I will always plan and wind the warp for my next project while my current project is still on the loom. 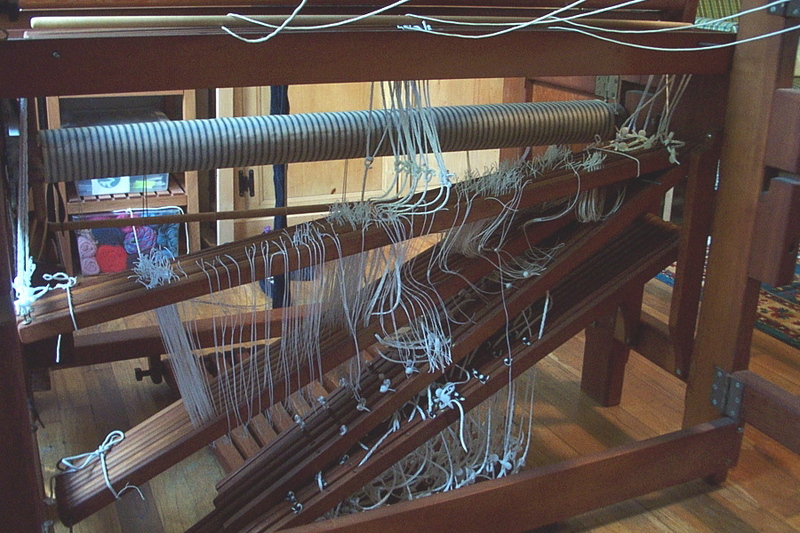 Once my warp is wound, it feels like the job of warping is half done–an illusion, I know. I play a lot of little tricks like that on myself. It’s surprising I haven’t gotten wise to them! I may not be half done when I’ve wound the warp, but with the reeling and beaming problems I’ve had in the past, those are the parts of warping that intimidate me. Like an omelet: that moment when you decide it’s time to turn it over or it will burn, and it all comes apart if you haven’t got the heat and the pan and the filling right (I tend to overfill). Once you’ve turned it over, successfully or unsuccessfully, setting the table and serving it up is easy. So far I actually like threading and sleying. They take longer but there’s no stress involved. Winding and beaming are easier to face if I don’t have to face them both at the same time. That said, I only just finished the second scarf on my navy merino scarf warp, but I have been spending a lot of time planning my next project. First a sample warp, for which I have the thread, but then I get to buy some! So, I finally placed an order to Vävstuga, something I’ve been meaning to do for a long time. There is something so neat and potential-filled about sample cards. When I took them out of the package, these gave me the same feeling as the oil pastel sticks lined up in a box of Cray-Pas when I was a kid. Unfortunately, when I tried to start using them to compare colors, I realized that they were not very functional. In tight rows you can’t use the samples as swatches. Not only to the colors confuse each other through juxtaposition, 3 square centimeters simply isn’t enough color for my eyes to make sense of. They are okay for matching. If I can find a piece of clothing or a book jacket with the color that interests me, I can hold it up to the cards and find the nearest color; but since the match isn’t exact, I can’t dependably take that piece of clothing and hold it against another thread sample to see if it goes. I’m not quite at the point of cutting the cards into strips and making a cardboard window to separate the colors. Vävstuga’s regular Bockens sample book had been backordered a long time with no guarantee as to when more would arrive, which is why I bought the separate sample cards. Does anyone know if the proper Bockens sample book gives you more yarn in a more useful configuration? I had been thinking of buying The Praktisk Vävbok for a long time. Seeing it advertised over and over again in my 80’s copies of Väv must have pushed me over. It is a nicely made book, a clean facsimile (all in Swedish) of one published in 1899. 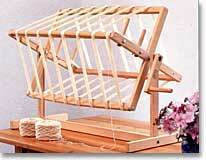 I enjoy the homey assumption that weavers want to use their cloth for everyday home sewing. 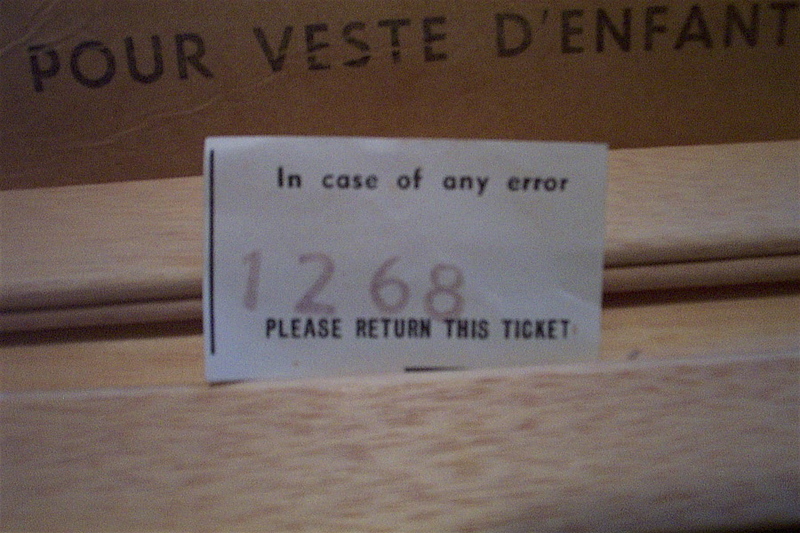 The drafts are named to purpose like “Children’s Clothing,” or “Upholstery,” or “English Hand-towel Material.” Another good thing about the book is that most of the patterns are for 8 shafts, probably because it is an old book which assumes that you are using a counterbalance–there are smaller sections for fewer shafts, but none for more than 8. 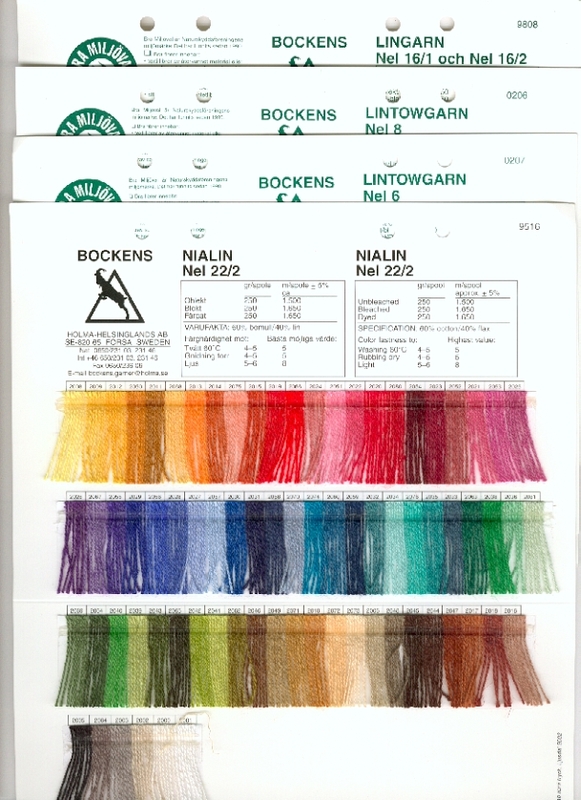 This focus is uncommon in Scandinavian weaving books. Usually more space is given over to either 4-shaft patterns or 10-and-upwards. Which brings me to my problem. 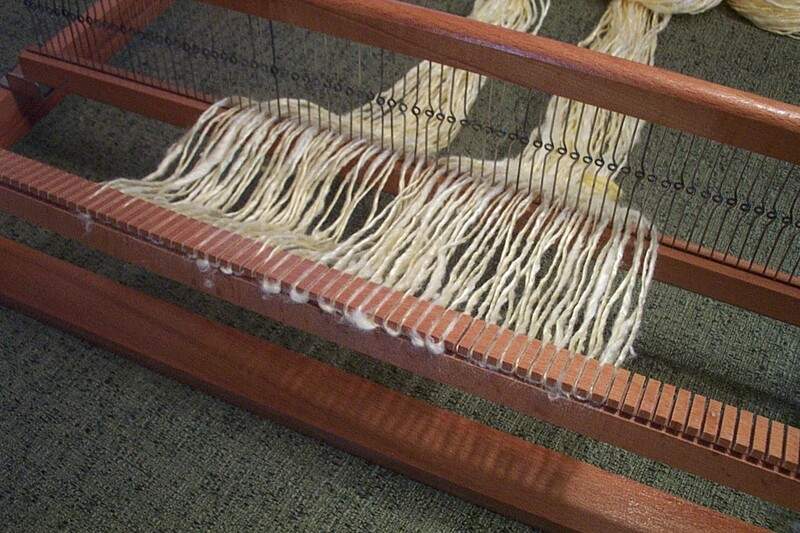 Most of the patterns are traditional 8-shaft plain and fancy twills. 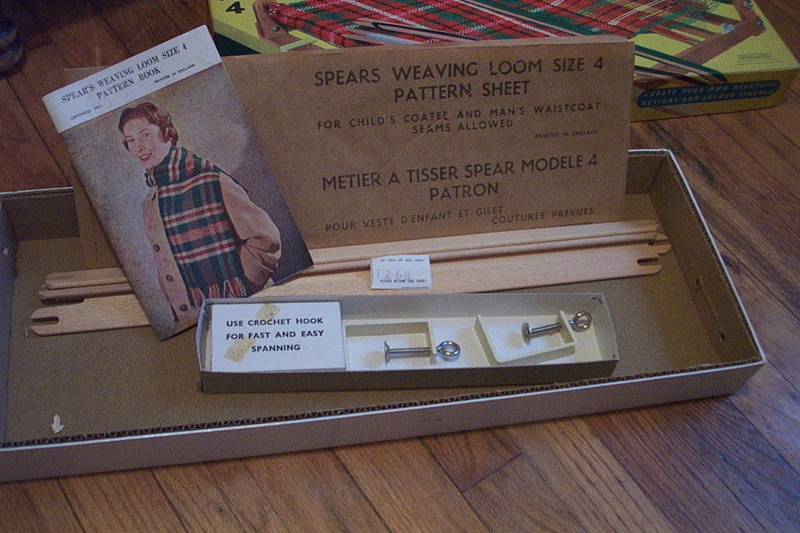 I already have the same or similar patterns scattered through my other Scandinavian weaving books or in Edward Worst. They are are all very Swedish looking–small all-over patterns familiar from old table linens. It’s nice seeing them in one place, laid out compactly with a spot black-and-white photograph of the cloth right next to the draft, but for a reference book I would really want something more exhaustive with better photos, like Helene Bress’ The Weaving Book, which I have been missing ever since I left it behind at the public library where we used to live (and which I probably shouldn’t even mention here, for fear of driving the price up even further!). Still, I like the fact that The Praktisk Vävbook features the 8-shaft versions of these twills. It’s not too big, pleasant to hold, and it has the further advantage of not making my nose stuff up and my my throat and eyes itch. 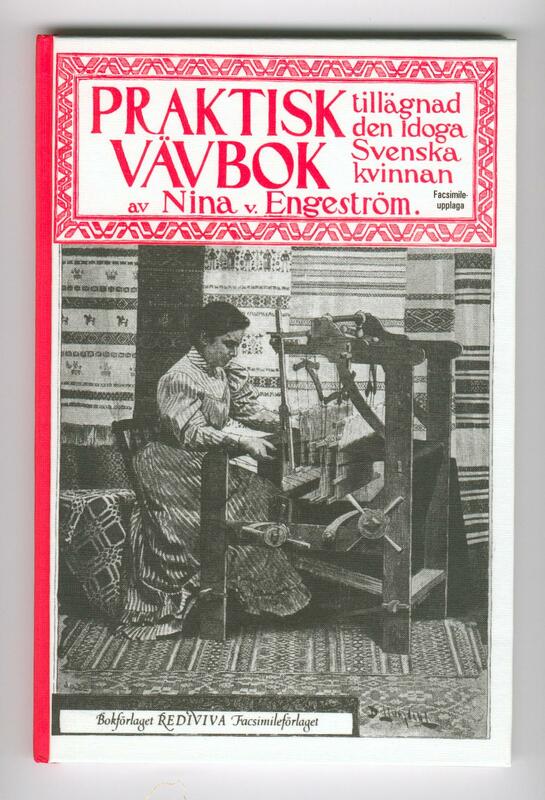 I got most of my old Scandinavian weaving books as a lot on ebay, from a weaver’s estate. They had been sitting in a shed or something for a long time and grown musty. Which is bad enough. But the real problem was that the over-zealous ebay dealer though it would be a good idea to mask the mustiness by putting them in a sealed container with a chemical air freshener for several days (I know this because I asked her). I aired them in the sun repeatedly, but the reek is tenacious. And now a little cord update: I looked into the smaller size of Texsolv tie-up cord Susan told me about after the Texsolv post, but according to the nice people at Woolhouse Tools, the smaller cord is a really, really small gauge, and not strong enough for lamm or treadle tie-up. The buttonholes have the same 12 mm spacing as the regular cord, which won’t help with fine adjustments. The Woolhouse people suggested I loop the cord back through itself to adjust in smaller increments. 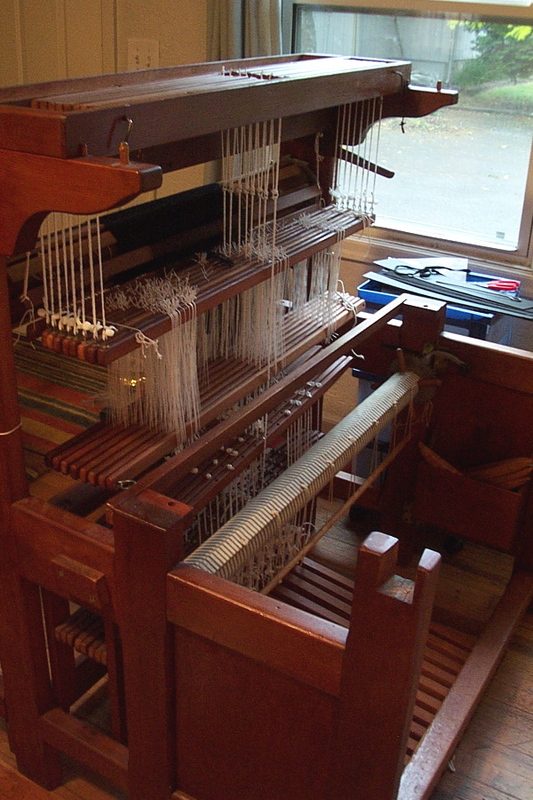 I know what they’re talking about, but I don’t think it can help with a Bergman loom because of the way the cords go to cup hooks rather than through holes in the lamms. I will fiddle with the cords and the pegs some more when I do my next tie-up. There may be some configuration of Texsolv and peg I haven’t thought of. This would be a lot easier with a trained monkey. Smaller fingers. Fits under the loom. My Bergman loom came with a 4 1/2” high, 15 dent reed made by the Andrews Co. When I started looking for a second reed, I discovered that the 4 1/2” height is not standard. (I’m guessing the Bergmans ordered their reeds in bulk from a mill supplier.) I looked around the internet for the Andrews Company of Spartanburg SC, to see if they were still in existence, or if some of their reeds were still floating around . . . but no. Then I looked into suppliers of modern-day industrial reeds. Too complicated and expensive for a private buyer. This is what the owner of a weaving store suggested. Her Glimåkra reeds were discounted because she was selling her business. She was so certain about the adjustability of ALL beater tops, that against my better judgement I took home a reed. Surely the 1/2″ difference was so small it wouldn’t matter? It did. 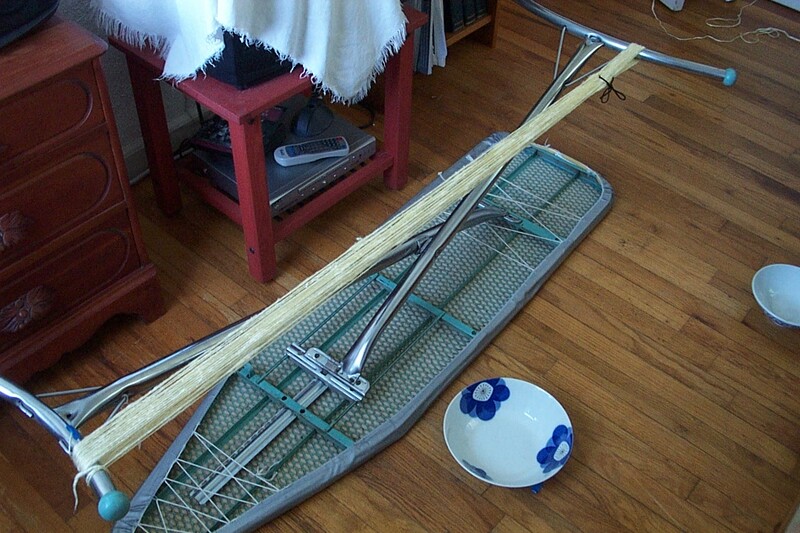 There really is such a thing as a non-adjustable beater top. 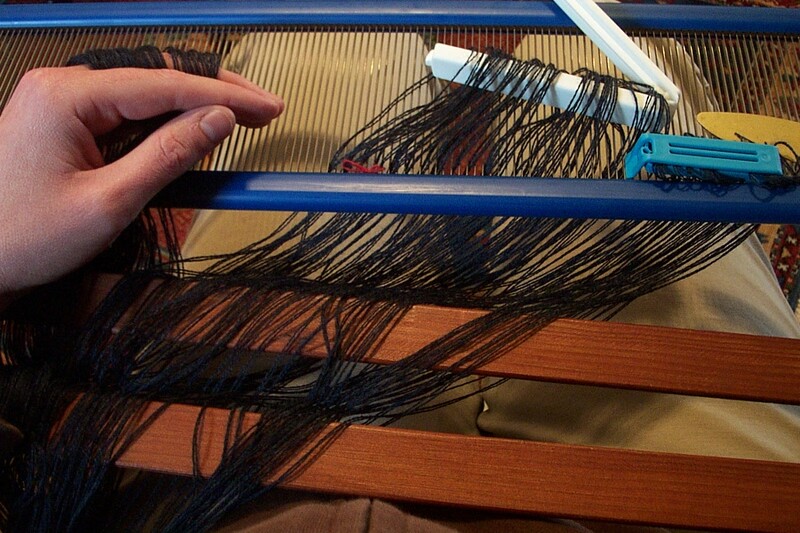 I had my reservations about those custom handweaving reeds because the bars looked too wide. Unlike Glimåkra reeds, which have duct tape wrapping the bars, the custom reeds’ are covered with wide, hard strips of plastic. My sheds were already making contact with the narrow lower bar of my Andrews reed. The last thing I needed was a reed that interfered with my already tiny sheds! 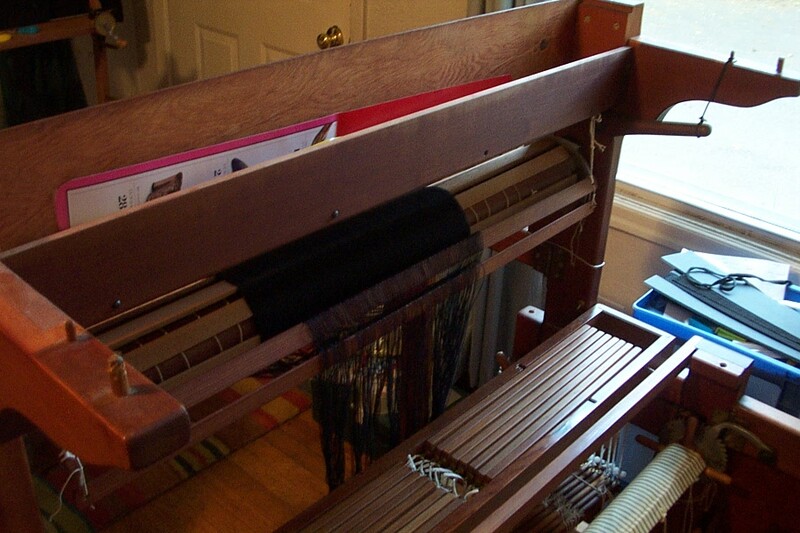 In the end I went ahead and ordered a custom reed from a Large Well-Known Weaving Supply Company. It took a LONG time to arrive. Far longer than they had warned was possible with custom reed orders. Longer still. Several long times. Finally it came packed in nothing but a flimsy cardboard wrapping. Naturally, it was bent! I was allowed to return it because UPS would refund them the cost. I was just as glad to be rid of it. Even if it hadn’t been bent, it looked really poor. My story ends happily a year later. The moral: LeClerc reeds are not really 5 inches high. Their actual measurements are 4 3/4 inches. The other moral: Earth Guild is great! Here I am pre-sleying my new LeClerc reed. 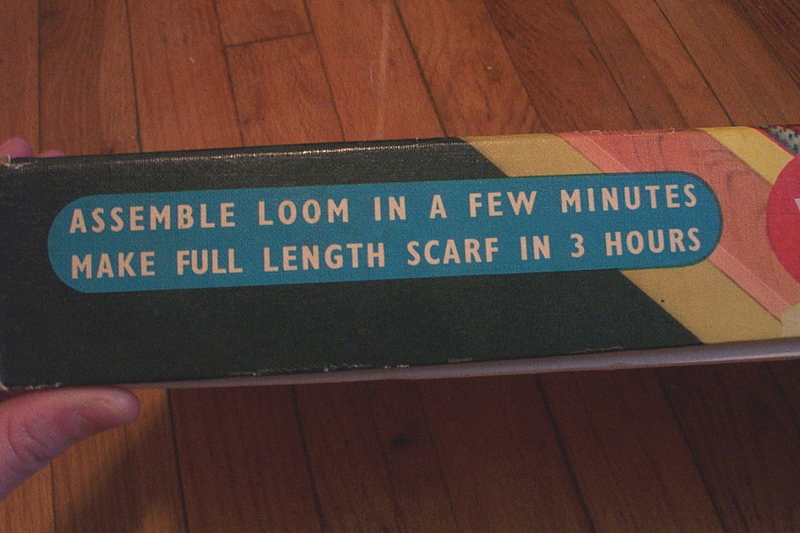 I’ve had it a few weeks, but I wasn’t able to try it in my beater until I’d cut the blue-and-white runner off the loom. It’s tight in the grooves (I can’t adjust it side-to-side without taking my beater apart and prying it clear out), and the beater top rests 3/16” above of its proper place, but it’s secure enough to weave with. I hear LeClerc started using molded plastic pieces on their reed bars about a year ago. Their plastic is less bulky than the plastic on the custom reed, but if I ever find an old tape-wrapped LeClerc reed, I’ll certainly buy it. I suspect it will fit more smoothly into my beater. The IKEA clips are great for pre-sleying. Because they are made to accommodate a gathered plastic bag, they don’t pinch the yarn tightly enough distress it. 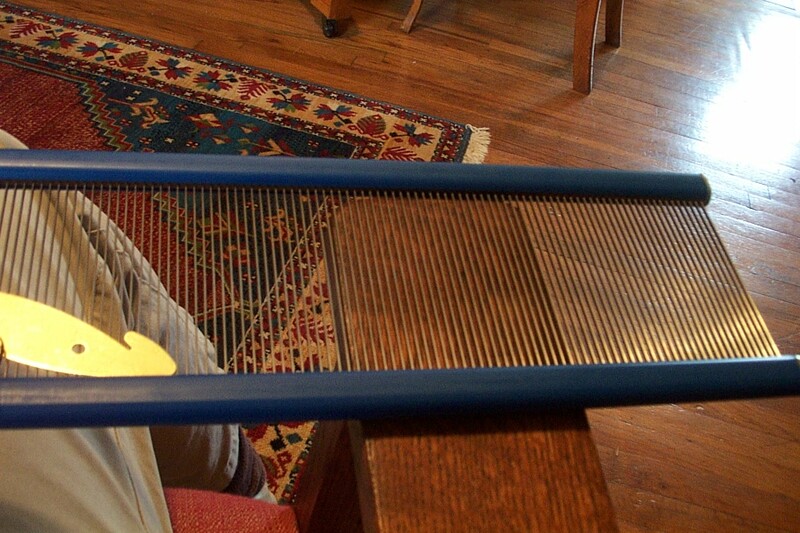 You can see how the ends of my rocking chair arms keep the reed from sliding against my body. I can easily pick everything up and put it on the floor if I need to get up. Today I have been trying to take pictures as I beam on and start threading. I’m naturally disinclined to photography–maybe because I get one passable shot for every 7–but we’ll see how it goes. I have a confession to make. Even though I am looking forward to working with some color at the end of my warp, I have been dawdling about getting there. I don’t really want to be finished, because that means it’s time to get out the warping reel and get frustrated. It doesn’t help matters that my warping reel makes one side of the warp ever-so-slightly longer than the other as it climbs the pegs. I have to compensate for the lopsided tension by combing it as I beam. I’d like a better reel, but I’m afraid the tension problem is endemic to them. 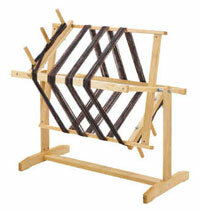 My current reel is similar to the Louet yarn-blocker/warping reel. It lacks those separate cross-pieces that carry the pegs on Schacht and most other horizontal reels. Yet even with better-positioned pegs, isn’t there is always going to be a tension discrepancy as the plane of the wound warp transfers from the horizontal barrel of the reel to the perpendicularity of the pegs? Any fellow reelers out there? I would love to hear your take on this problem. What sort of reel do you use? 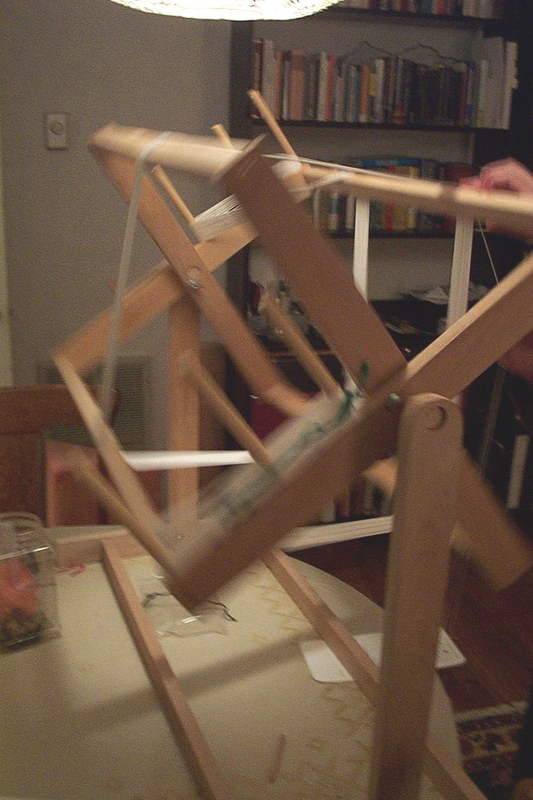 Can you wind an evenly tensioned warp with it? 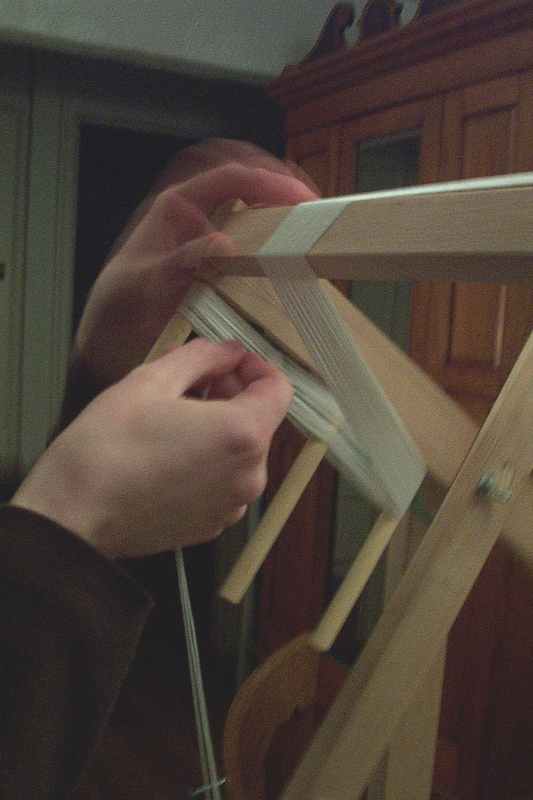 As for the beaming, I beamed my first few warps by myself when I was warping Swedish-style. (That’s the back-to-front threading method where you sley the reed twice, using it as a raddle the first time). The tension wasn’t too bad, and frankly I can’t remember how I managed it! 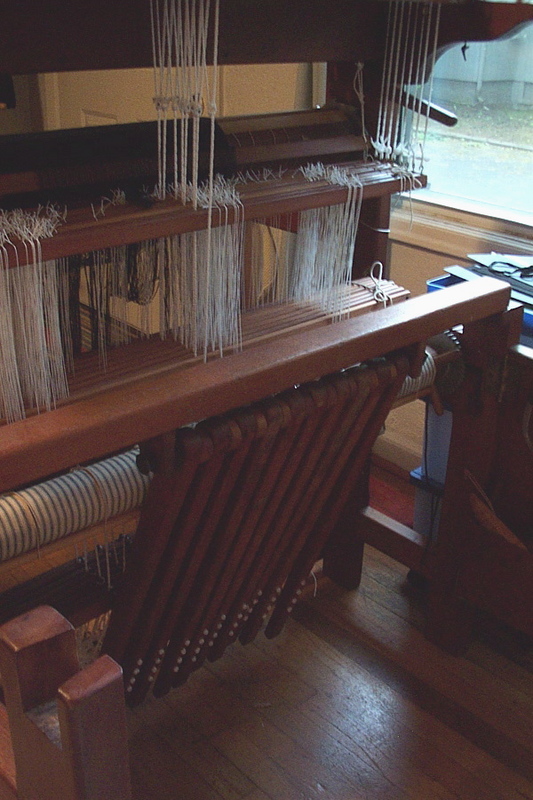 I was using 15-dent reed, so that might have helped–the friction as the yarn pulled through. So I’ve given in. 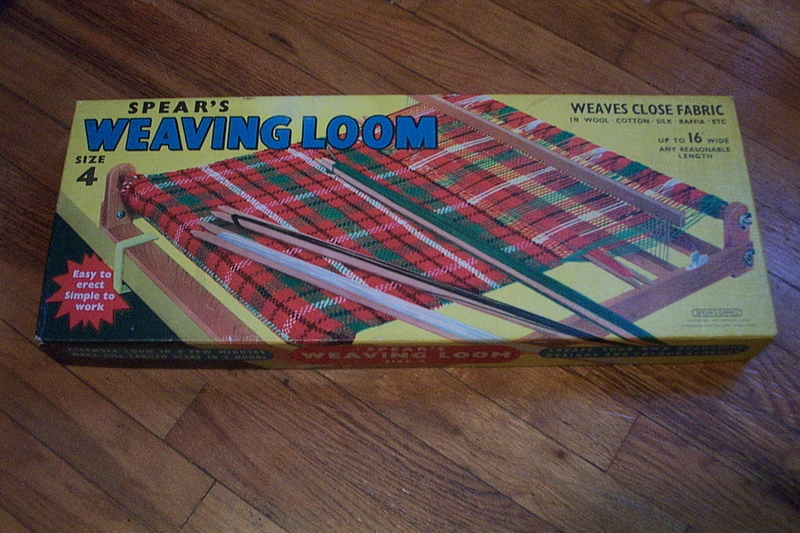 My loom is Swedish. Designed by a Swede, built by Swedes. Okay! I’ll dress it like a Swede, for Pete’s sake! I’ll follow your directions to the letter Mrs. S-G. Unfortunately you don’t say how you kept your tension. On Bergman looms the main warp beam rests in the castle, a little higher up than the back beam. If I’d thought logically about this fact, I’d have known a raddle wasn’t the way to go. But I wasn’t thinking logically. 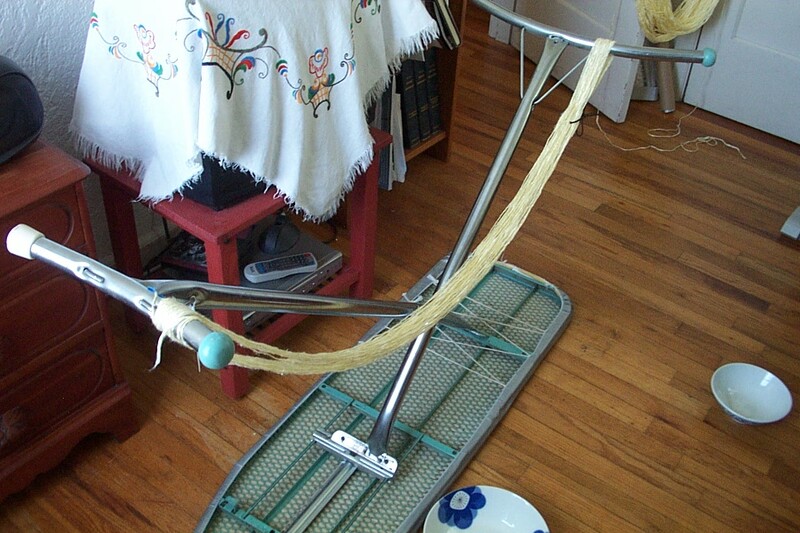 I was thinking that I didn’t want to sley the whole warp twice. 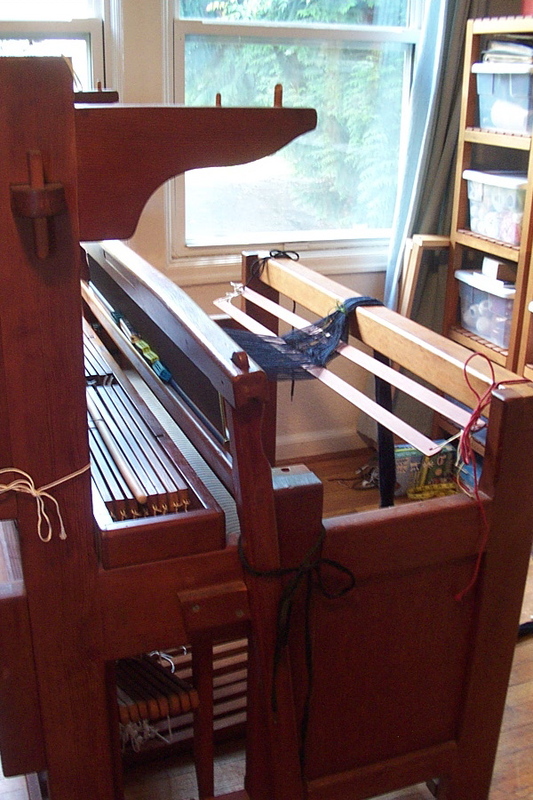 After struggling to lay my warps in an open raddle without accidentally lifting a piece of them out again or knocking the rod out of the loops and onto the floor, I’m not going to mind the extra sleying so much. I now have a rocking chair with arms that are perfect for propping a reed across my lap. 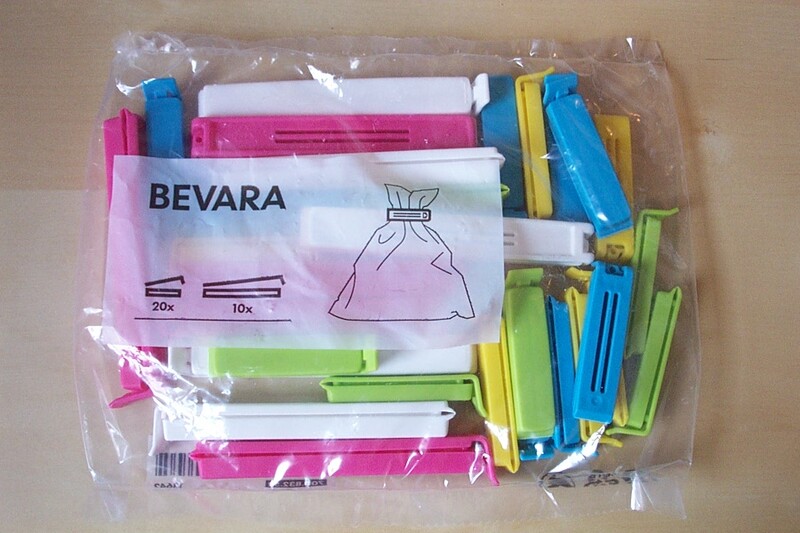 And great plans for some bag clips from IKEA. The tension problem remains. 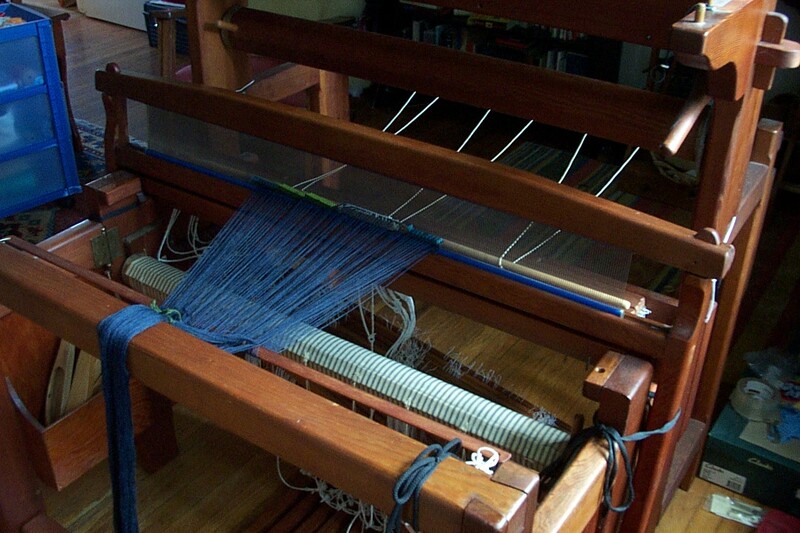 I don’t have enough floor to drag the warp across it under weights as Elkhorn Mountain Weaving recommends. I don’t have a warping trapeze like the Vävstuga folks. If I were a homeowner, I would hang chains from the ceiling and suspend my warps over a wooden closet-rod. For now I guess I’ll try the milk jug trick. It’s just that my beam is so low, I’ll be rehooking them every 12 inches. Advice is welcome! Wish me luck.